A century ago, Los Angeles became dependent upon a distant watershed and began funneling its life-giving liquid into a vast aqueduct to nurture the city’s delirious growth. 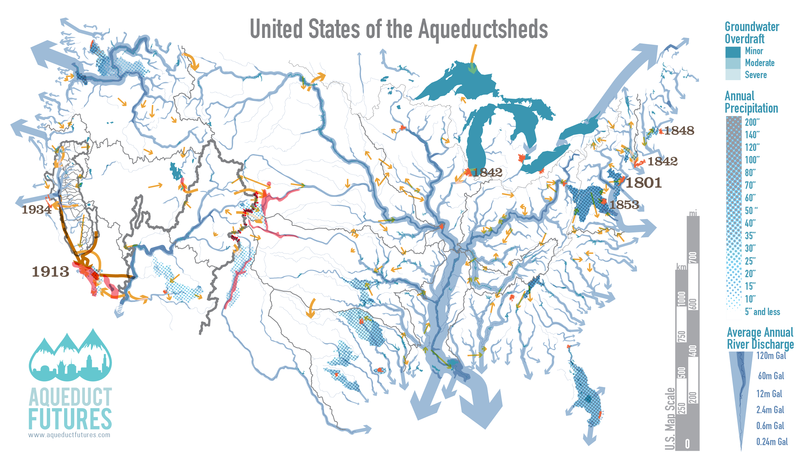 The complicated history of the aqueduct has been perpetually reshaped by networks of negotiation, litigation, and exploitation. Collectively, this has transformed Owens Valley into a dynamic infrastructural environment driven by the complex interaction of social, technical, and ecological forces. In this portion of the exhibit, we define Owens Valley within the context of “flows”…of water, energy, people, flora, and fauna. Visualizing and mapping these complex interactions helps us to begin understanding the vast aqueduct system that has been so critical in the growth and development of the Los Angeles area.